Twitter is promoting this heavily on every Twitter page with “Apple fan? 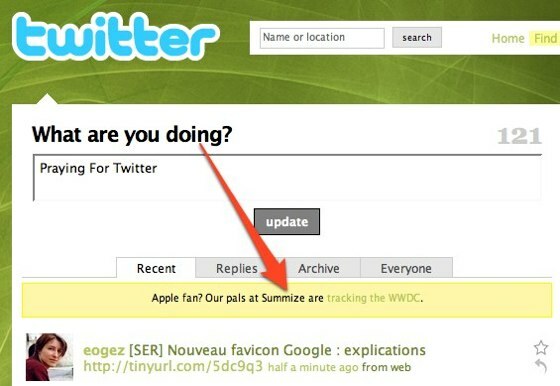 Our pals at Summize are tracking the WWDC.” I didn’t notice it myself (I use Twhirl and rarely visit the Twitter site), but others have. It’s no surprise that Twitter is pushing this – they are actively trying to find ways to reduce the database load on their frail infrastructure during the event, and pushing users to a third party service will help. If Twitter goes down, though, there’s nothing Summize will be able to do to help. I’ll say one thing for Twitter, They have community dedicated to keeing the service alive. Pushing page views and the constant refreshes to a third party is real service. Golf clap for Summize.